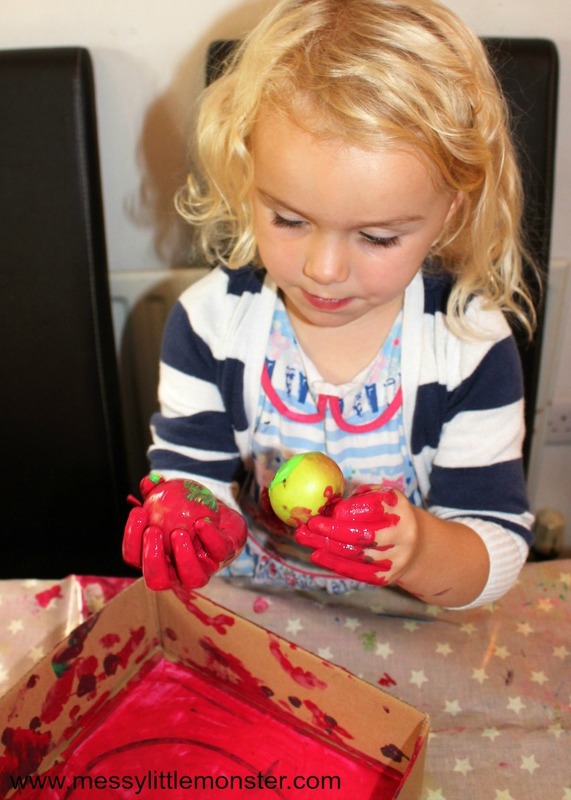 Apple theme activities for kids are always popular at this time of years as Autumn crafts get under way. 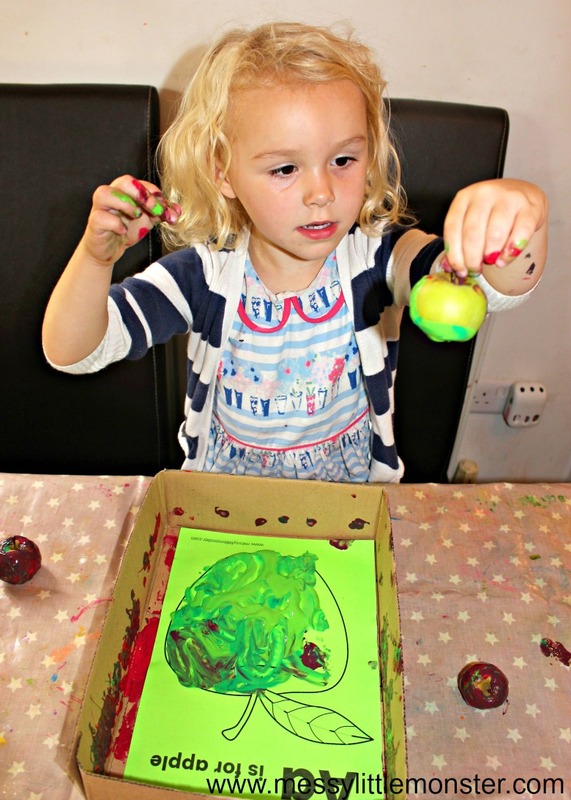 If you are looking for a fun and easy art activity for preschoolers then painting with apples can be great fun! Use our free A is for apple printable worksheet to help your child learn the letter A whilst having fun getting messy painting with apples! If you are looking for more apple theme preschool activities take a look at our apple tree fingerprint counting and our graham cracker apple snacks. Autumn is such a beautiful time of the year as the leaves start to turn. There is nothing better than going out for a walk on a crisp Autumn morning and crunching through the autumn leaves. There are always so many things to see and collect! 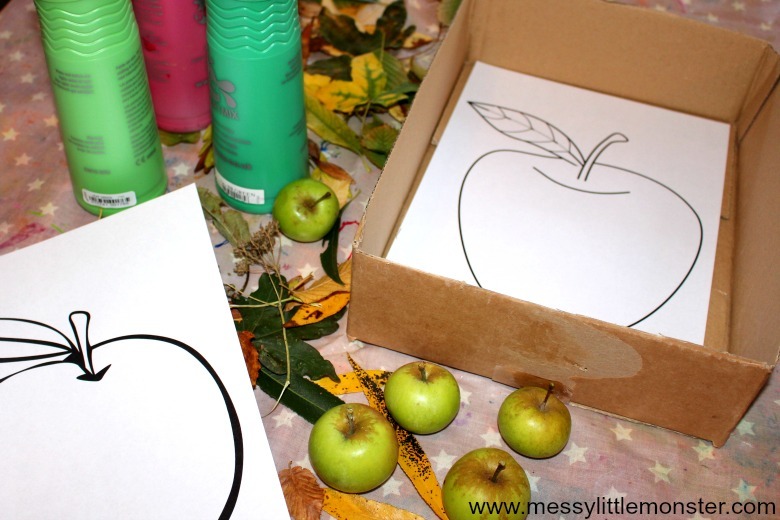 For todays apple theme painting activity why not go out on a nature hunt with your toddler or preschooler, find some fallen apples and then use them to paint the apple printable! After your Autumn walk you may want to try a few more Autumn activities. Toddlers and preschoolers would love to make some leaf puppets or a leaf hedgehog using leaves they have collected on their walk. This handprint Autumn tree is very cute too! Below you will find step by step instructions for this apple theme art activity. You can also have lots of fun painting with acorns like we did when we made our leaf garland or painting with water beads. As we mentioned earlier letting your toddler or preschooler collect the apples needed for this activity can really add to the fun. 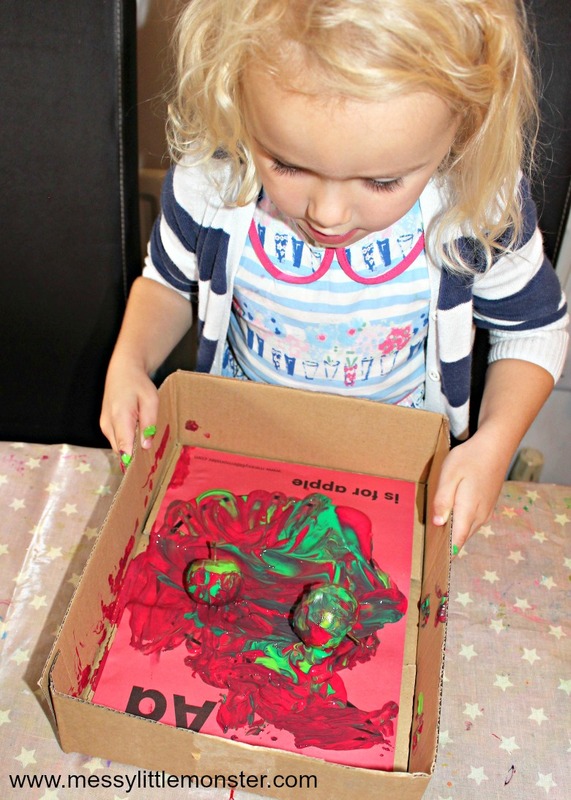 Once you have your apples you will need to print out the apple printable, find a box that is a similar size to your printable and choose some paint in apple colours. You can print the apple printable out onto plain white paper or choose an apple colour. 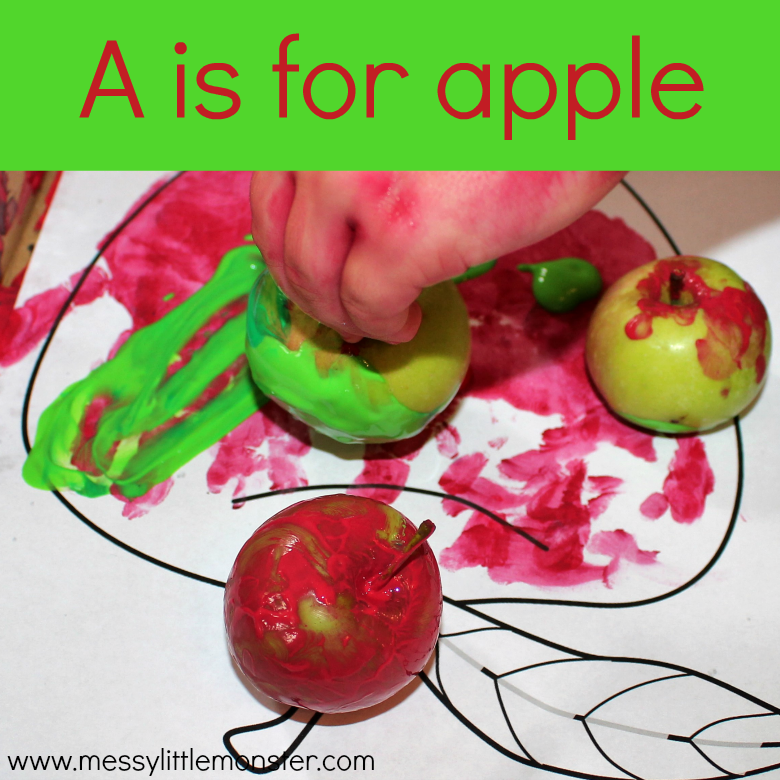 I would suggest printing out lots of the a is for apple printable as once your toddlers and preschoolers get started with this fun art activity they won't want to stop! 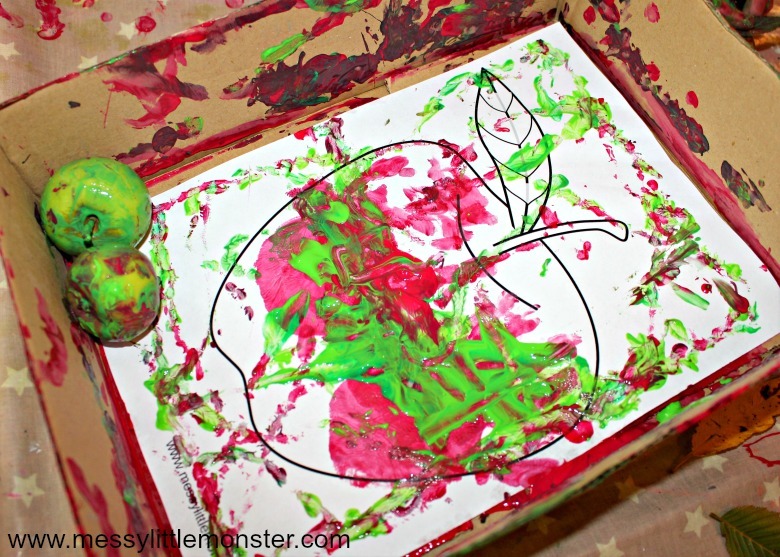 Place your apple printable inside the box and invite your toddler or preschooler to squirt in a little paint. Try to encourage them to choose apple colours. This is a great learning opportunity as it makes them really think about why they are choosing certain colours. Put a few of the apples you have collected into the box and use the apples to paint the printable. There are a few ways you can do this. The most fun way is to shake the box as hard as you can from side to side so that the apples roll about in the paint and leave paint marks across the apple picture. The effect created by the paint will vary depending on the paint colours used, the colour of the paper and the amount of paint used. 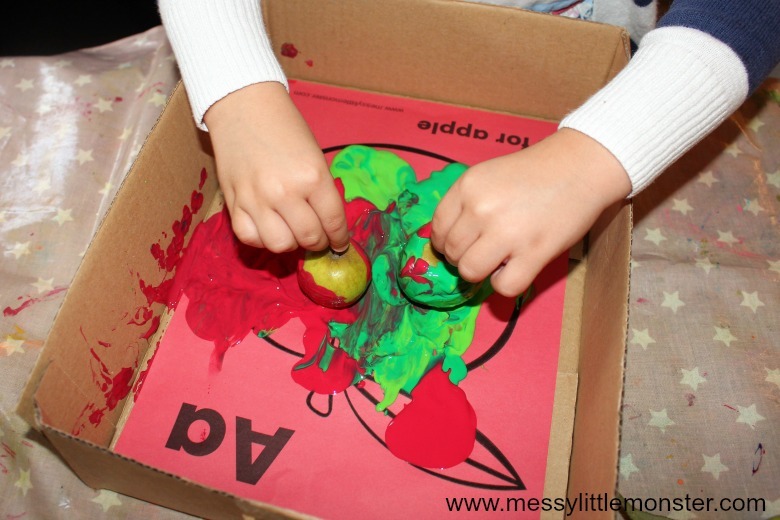 I personally think that this apple activity works the best when there is only a little bit of paint added, but it is important to let your child explore the different effects themselves. They will quickly realise that if they use too much paint it is hard to see the apple outline on the printable. Your toddler or preschooler may choose to use the apples like a paintbrush to paint inside the appple outline. This is a great way of painting for children that are concerned about only painiting inside the apple outline. 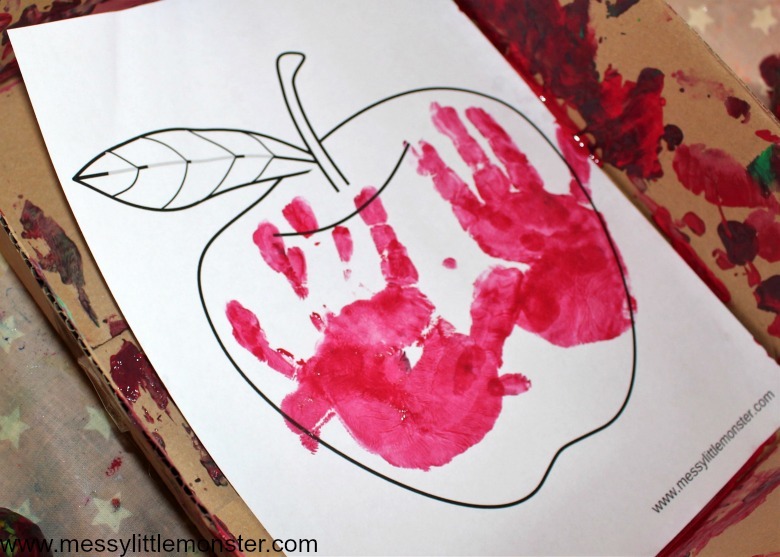 Your child may enjoy covering their hands in paint and painting their apple outline using handprints! Or they may even choose to paint the whole apple printable in one colour! During this apple them art activity try to give your toddler or preschooler the opportunity to handle the apples and encourage them to talk about the colour and size of the different apples. To download this A is for apple printable worksheet for free add $0 and click on the 'I want this' box below. It may take a moment for the page to load so please be patient. 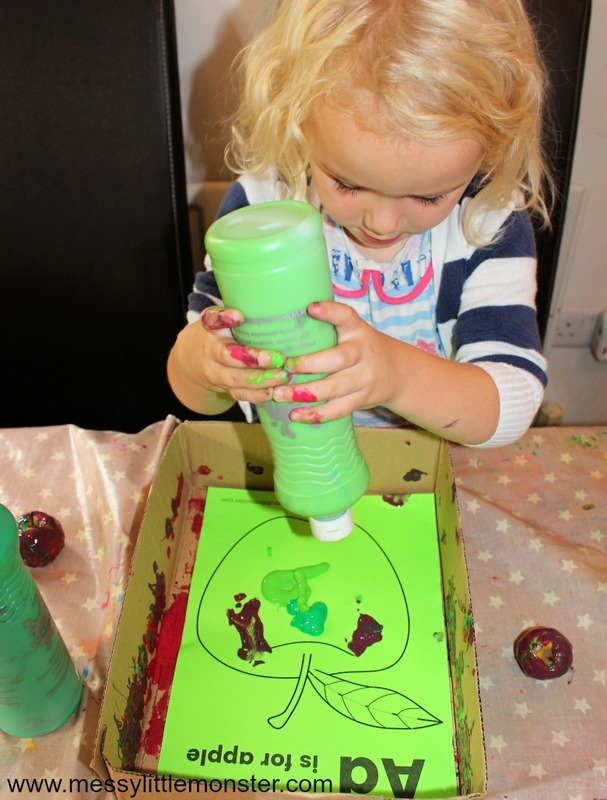 Whichever way your toddler or preschooler chooses to paint their apple printable they are sure to have fun! 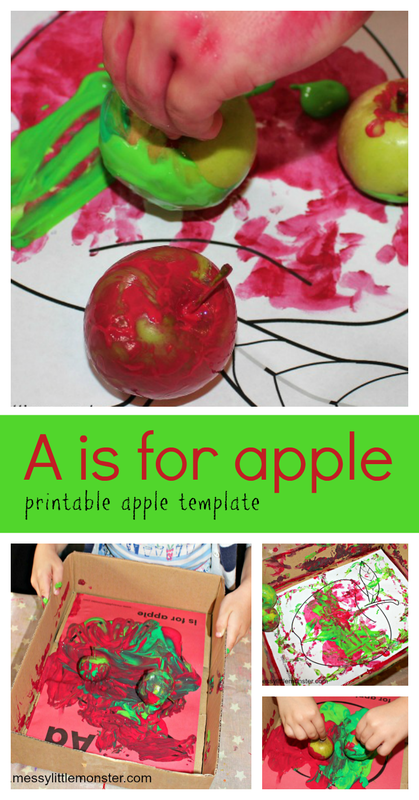 Apple theme art activities for preschoolers like this are a great way to help your child learn the letter A and that A is for apple!